As the cruise division of Britain's largest travel agency and tour operator, German-owned Marella Cruises (formerly Thomson Cruises) occupies a unique place in the British cruise market. Founded in 1965, Thomson soon established a dominant position in the vast UK all-inclusive tour market, with its own travel agencies, airlines and more. In the company's first foray into the cruise market in 1973, Thomson chartered two former ocean liners from Greek owners but by 1976 had failed to capture an audience, like so many other budget cruise lines of the 1970s era. But in 1995, it restarted cruise operations by chartering a small ship, The Sapphire, from Cyprus-based Louis Cruise Lines. Thomson Cruises soon chartered a variety of other ships, including Island Breeze from the now-defunct Premier Cruises, The Topaz from former Premier executive Paris Katsoufis, and another Louis ship, The Emerald. Thomson aimed to have an effect on the British market much like Carnival did in the U.S. -- that is, to move cruising from a niche market to the very mainstream of British tourism. Thomson had already made the package holiday hugely popular in the U.K., and wanted to do the same for cruising. Despite its aging ships, Thomson had several elements that lured an ever-increasing number of Brits to cruise for the first time -- name recognition, a large presence of its travel agencies across Britain and attractive fares. However, unlike Carnival, no Marella ships are based out of the U.K. -- all are based in the Mediterranean or the Caribbean and operate fly-cruise itineraries only (although some ships occasionally call in at the U.K.). In 2008, Royal Caribbean sold its stake in another U.K. line, Island Cruises, to Thomson Cruises' parent company, TUI Travel. This meant that Island Star left the fleet in March 2009 to join Royal Caribbean's Spanish brand, Pullmantur, while Island Escape joined the Thomson fleet in spring 2009 to continue offering informal cruises to the U.K. market. Thomson Dream, a transfer from Costa Cruises, joined the rotation in spring 2010. 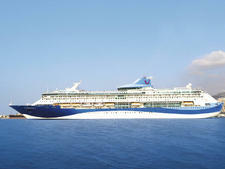 Thomson Majesty joined Thomson in May 2012 as part of a ship swap that sent Thomson Destiny to the Cyprus-based Celestyal Cruises (formerly Louis Cruises). Thomson Spirit is also owned by Celestyal Cruises and chartered to Thomson. 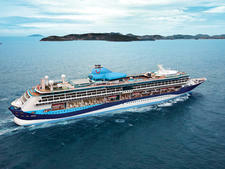 In 2015 Thomson acquired Splendour of the Seas from Royal Caribbean, and confirmed it would be renamed TUI Discovery. It then offloaded Island Escape in late 2015. When TUI Discovery joined the fleet in June 2016 it became the line's flagship and largest ship, with 915 cabins (almost 40 percent with balconies) and 1,832 passenger capacity. Then in 2016, Thomson announced another purchase from Royal Caribbean -- this time the sister ship to Splendour, Legend of the Seas, which joined the fleet 2017, and up until October 2017 sailed under the name of TUI Discovery 2, before being changed to Marella Discovery 2. The acquisition increased the fleet to six ships, and marks four ships in the next four years for Marella: Mein Schiff 1 and Mein Schiff 2 have been acquired from TUI Cruises, with Marella Explorer joining the fleet in 2018 and Marella Explorer 2 joining the fleet in 2019. Marella Majesty left the fleet at the end of 2017 and Marella Spirit left the fleet in late 2018. In October 2017, the Thomson name was erased from the U.K. high street and online, with the operator becoming known henceforth as TUI -- the same as its German parent. However, rather than renaming the line TUI Cruises U.K., Thomson Cruises opted instead changed it completely -- to Marella Cruises, which means "shining sea" in Celtic. 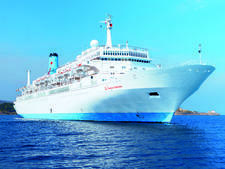 From its reemergence as a budget cruise operator in the 1990s, Thomson progressively improved its product and became more mainstream in the cruise industry by improving its ships, amenities and service while also branching out to a wider range of itineraries. 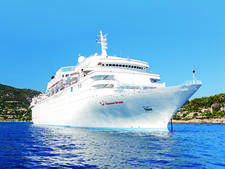 The line also undertook a fleet-wide renovation project called Thomson Platinum Cruises that aimed to align the cruise experience with that of its better package holidays. Marella's onboard experience sits somewhere between traditional (British cruise lines like P&O Cruises and Fred. Olsen Cruise Lines) and ultra-casual (now-defunct Ocean Village was something of a competitor). 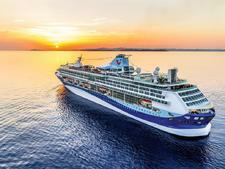 For the most part, Marella follows a traditional cruise format. All six ships feature open-seating dining. On all ships, there's also a casual buffet restaurant open for all meals, and Marella Dream and Marella Celebration and new ships Marella Discovery, Marella Discovery 2 and Marella Explorer also have an a la carte dinner option. The dress code is casual except for the one formal night, when the buffet restaurant stays casual for those who don't want to dress up. Traditional cruise activities such as production shows and a casino are featured. Marella attracts a broad cross-section of the British working class along with people of all ages. The company has always attracted many first-timers but has also begun to see an increasing number of repeat passengers who do not wish to "move up" to fancier lines. On all the ships there will be a number of families, especially during school holidays, but couples and singles are certainly well-represented. Marella Cruises currently operates a fleet of five vessels (with a sixth on the way in 2019), all of which have undergone refurbishments since 2012 or are new to the line. Ships given makeovers have an updated look and feel that includes flat screen TVs in cabins, iPod docking stations in suites, tea and coffee making facilities in every cabin and a themed a la carte restaurant. Marella Dream was the first ship to be refurbished in December 2012, closely followed by Marella Celebration in May 2013. Dream and Celebration have both added the Kora La Asian restaurant to their list of onboard culinary offerings from 2015. And in addition to the interior updates, sea view balconies were added to Marella Celebration in November 2013. The 1,254-passenger, 33,930-ton Marella Spirit (built in 1983 as Holland America's Nieuw Amsterdam) is owned by Celestyal Cruises (formerly Louis Cruises) and has been on charter to Marella since 2003. The ship recently left Marella Cruises' fleet and returned to Marella Spirit. The nearly identical Marella Celebration (built in 1984 as Holland America's Noordam) joined the 2004. In 2009, when Island Cruises was sold to Thomson's (as it was then known) parent comany, TUI Travel, another ship joined the fleet, the 1,504-passenger, 40,132-ton Island Escape, which was once Royal Caribbean's former Viking Serenade. It was sold in late 2015. In April 2010, the 54,000-ton, 1,506-passenger Marella Dream joined Thomson, having previously sailed as Costa Europa. The 40,876-ton, 1,462-passenger Marella Majesty was added in May 2012 as part of a ship swap that sent Thomson Destiny to Celestyal Cruises. Majesty left the fleet in late 2017. Thomson announced the acquisition of Royal Caribbean's Splendour of the Seas in 2015, which became TUI Discovery in June 2016 and then Marella Discovery the following year. The ship has 915 cabins (almost 40 percent with balconies) and 1,830 passenger capacity. It was joined by sister ship, Legend of the Seas in May 2017, which was renamed TUI Discovery 2 and then Marella Discovery 2. An even larger ship, Marella Explorer, joined the fleet in 2018 and is set to be joined by sister ship Marella Explorer 2 in May 2019.